There are 27 oil rig platforms along the coast of California. The first letter of a platform name has to do with its north/south location. Platform Irene is the furthest north. Emmy is the furthest south. Three were named with a letter: A, B & C. The 1969 Santa Barbara oil spill occurred from Platform A.
Venoco, with offices based in Carpinteria, California, operates platforms Gail, Grace, and Holly. 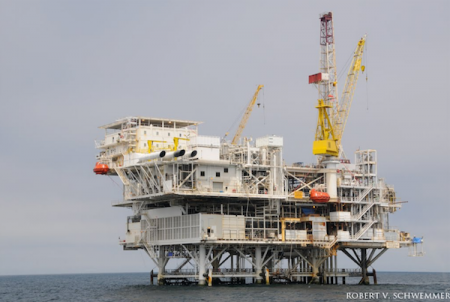 Exxon Mobil Corporation's Platform Harmony, in 1200 feet of water, is the largest and deepest platform offshore southern California. From sea floor to top, it is taller than the Eiffel Tower and the Empire State Building. Rincon Island in Ventura County, approximately 1000 feet offshore, is an artificial island in the Santa Barbara Channel built in 1958. It is the site of oil production in 55 feet of water near the seaside communities of Mussel Shoals and La Conchita. Oil is pumped via pipeline to shore. Rincon Island is connected to the mainland by the Richfield Pier, currently considered unsafe for vehicular traffic other than golf carts. Long-term bans were placed on new oil field leasing in State waters in 1969, and in Federal waters in 1984. Drilling and production continues on existing leases. It is expected that oil and gas platforms eventually will be decommissioned as they reach the end of their useful oil and gas production lifetimes. Laws and regulations have changed in anticipation of decommissioning to allow feasible alternatives such as the creation of artificial reefs, in a movement known as Rigs to Reefs. Oil exploration on and around the California Channel Islands began as early as the turn of the century. However, the would-be prospectors soon found out the islands were already reserved by the U.S.government for lighthouse purposes. This page was last edited on 21 March 2019, at 19:44.